The major themes of this meeting concerned toxicology, mining, asbestos, and public policies on environmental and occupational health. It was within this framework that on Wednesday February 19, papers on various facets of the asbestos controversy were presented by researchers from the Istituto Superiore di Sanità, Italy. Pietro Comba opened the session with a discussion of the health impact of asbestos in Italy; Fulvio Cavariani spoke about: an asbestos census in workplaces and the environment and processes of sanitation and management of asbestos-containing waste; Daniela Marsili examined policies for the control of asbestos-related diseases worldwide. After a brief recess, Roberto Pasetto considered measures to estimate the burden of asbestos-related diseases. Paola De Castro wound up the input of Italian experts by discussing the role of scientific communication and open access in public health. Professor Jairo E. Luna (National University of Colombia) has been an indisputable ally in issues related to asbestos and worked closely with me on the research and text for the next paper presented at the symposium; our text summarized the current asbestos situation in Colombia. Over recent years, I have been researching my countrys asbestos history and, as an artist, explored means to visualize elements of this story to raise public awareness of the asbestos health hazard. In Colombia, October is celebrated as the month of art with the Chamber of Commerce funding the art fair in Bogotá ArtBo. Parallel events have sprung up within the citys cultural calendar to provide the space for public engagement with other issues not covered by ArtBo. 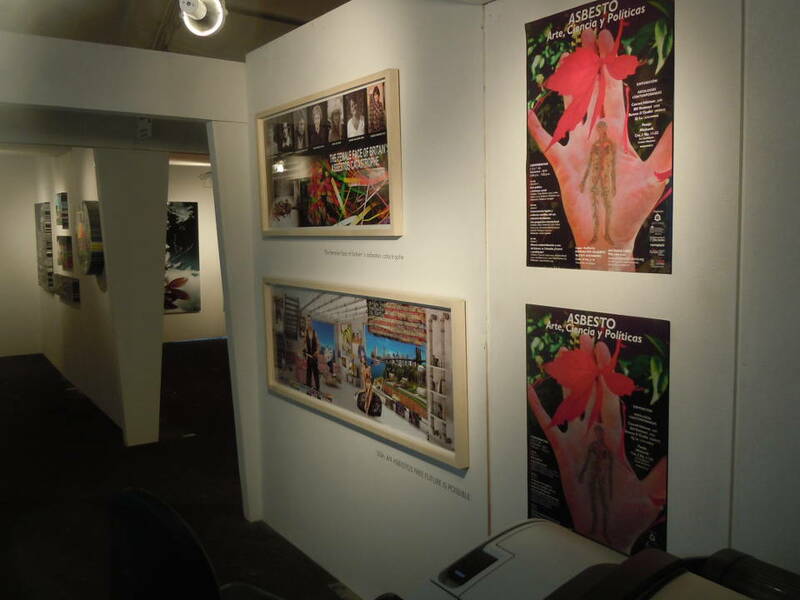 In October 2014, the global asbestos scandal was the focus of artwork which I displayed at the Sincronia art fair. In addition to displaying pieces about the deadly impact asbestos has had on populations in the UK and the US, I was able to speak directly with Colombians on the subject of asbestos. Although nearly 50% of people that came to the stand had some knowledge of this subject, most were unaware that our country was still using asbestos and the different ways in which it was being used  i.e. in asbestos-cement corrugated roofing tiles and water tanks. Another advantage of this show was the opportunity to distribute 1000 brochures and 500 posters inviting the public to the conferences that would be held 15 days later. The possibility of combining art, science and policy in the campaign to raise asbestos awareness in Colombia was a result of the research I had done on the subject. During these investigations, I had consulted the British artist Conrad Atkinson who donated the image for the conference poster. My interest in this subject began when I read an article written by Laurie Kazan-Allen reviewing the role of women in the UKs asbestos tragedy. Thus I began to conceive the possibility of visually narrating the negative impact that the commercial use of asbestos has had around the world. The latest image, which is about the US, was inspired by the famous collage of British artist Richard Hamilton, now widely regarded by art historians as the first representative picture of Pop Art. Considering the interplay between science and art, I approached the Alzate Avendao Foundation (a public cultural institution in Bogotá) about conducting a series of lectures and art exhibitions related to the issue of asbestos. An interagency working group was set up to provide the support and expertise rquired to organize the series of conferences and events ASBESTOS: Art, Science and Politics. To maximize the opportunity for information sharing and public debate, the symposium was divided into three days of activities. Discussions about political art took place during the first day, with a special emphasis on the artists participating in the exhibition on art and asbestos including Conrad Atkinson, Bill Ravanessi and Bureau d'études. Issues also considered included the politicization of art  e.g. the purchase by the former Swiss owner of the Eternit asbestos multinational of a major collection of contemporary Latin American art. The artist and art critic Lucas Ospina, director of the Art Department at the University of the Andes, made a presentation about: Colombian and international political art, and the interaction between political art and the art market. This first day was closed by Chilean anthropologist Tania Muñoz Cuevas, who told us about Chiles experience of banning asbestos, and international artist Alfredo Jaar, who highlighted contentious issues related to the ownership of the Daros art collection; work by Jaar has been acquired by this collection. In a letter sent prior to the conference, Cuevas had asked Jaar about the political implications of selling art to someone whose money came from the asbestos industry. His reply as well as his actions were criticized. Amongst the eminent international experts who spoke on the second day was Fernanda Giannasi (Brazil) who told us that asbestos was a health catastrophe which was downplayed by an industry-funded global disinformation campaign. Dr. Barry Castleman (USA), talked about the criminality of the asbestos business, listed criminal acts and cited prosecutions of asbestos executives and corporations. Like the tobacco industry, the asbestos industry should, he said, only be consulted by governments for the purpose of closing it down and dealing with in-place asbestos. Dr. Arthur Frank (USA) did a very pedagogical talk, asking What is the Big Deal About Asbestos? Issues discussed included: the special risk of asbestos to cigarette smokers; the role of animal studies; methods to remove asbestos safely; and the international transfer of the asbestos industry from developed to developing countries. Dr. Eduardo Rodríguez (Argentina), related the lies that the industry spread in Argentina to avoid banning asbestos and the negative consequences the industry predicted would occur after the ban, none of which occurred. Instead, there was an orderly transition to asbestos-free technologies. That day ended with Colombian asbestos victims telling the audience about their asbestos related diseases. On the third day, Speaker Paola De Castro highlighted the usefulness of new technology platforms and tools for communicating scientific information about the asbestos hazard. The discussion focused on scientific research in Colombia and legal requirements for asbestos-processing and using workplaces which are, according to industrial engineer Dr. Juan Pablo Ramos Bonilla from Andes University, routinely flouted; Bonilla reported the identification of asbestos-related diseases amongst people employed in workshops repairing brakes for passenger and heavy duty vehicles in Bogotá. In addition, there is no way to control the mortal danger caused by breathing asbestos from building materials, when workers cut, drill or demolish ceilings or any other material containing asbestos-cement, such as pipes or tanks for drinking water. It is also necessary to stress that the transport of this mineral in its natural form or as a finished product, constitutes a latent danger of accidents for society as a whole and for the environment. More than 50 countries have banned asbestos. However, this industry continues profiting in countries where labor legislation is permissive and costs of cancer prevention and compensation to victims are almost non-existent. These companies earn, but those costs are paid by the victims and society in general. Since 2006, the WHO has called on all countries to ban asbestos as the only way to eliminate the diseases linked to asbestos exposure. This international organization states that 107,000 workers die each year from asbestos-related diseases. In addition, scientific studies conclude that likewise, a large number of people die from environmental exposure to this carcinogenic fiber. 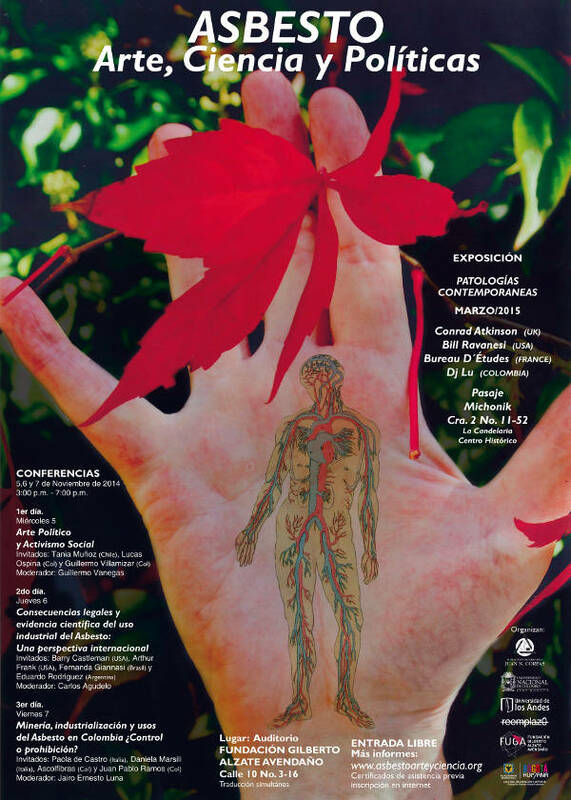 The publication in El Tiempo has been strongly criticized by the participants of the International conference Asbestos: Art, Science and Politics, sponsored by Fundaci�n Gilberto Alzate Aveda�o, Institute of Public Health of National University, University Foundation Juan N . Corpas and Universidad de Los Andes in Bogot� on 5, 6 and 7 of November 2014. Arthur L. Frank, MD and PhD in Biomedical Sciences, USA. This letter never received a response and was never published in the newspaper. It is important to acknowledge the role that the media has played in publicizing the asbestos problem in Colombia. In December 2014, a primetime TV program for the first time aired a program dicussing the countrys asbestos tragedy. This program made visible the face of the victims and detailed the environmental catastrophe that endangered the public as well as workers. Journalists who conducted the investigation, took advantage of the presence of Barry Castleman in Bogotá to interview him, and this footage was included in the program. Already the media are beginning to record legal actions by asbestos victims against companies that have been using this mineral for more than 70 years in Colombia. Taking advantage of the presence of international experts who attended the lectures during the first week of November, the Vice Minister of Labour received in his office Dr. Fernanda Gianassi (Brazil) and Dr. Eduardo Fernandez (Argentina), who, before a large panel of industry representatives, made the case for Colombia to end the use of asbestos. It is hoped that during 2015 more meetings will take place, so that the debate which began in Colombia in 2014 will produce results in 2015.